Spray foam insulation is a feasible option to curb energy costs and keep your house warm during the winters and cool in the summers. It is made using two composite materials namely isocyanate and polyurethane both using special equipment. The mixture is then used on heating hoses to the surface that needs insulation. 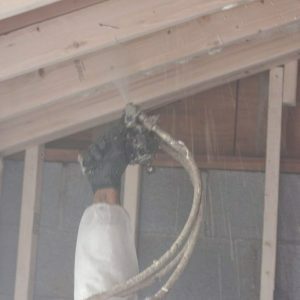 Spray foam insulation is a good investment for a commercial building or home due to its cooling and heating efficiency. It helps is saving costs and pest control. It is a good and easy process that can be good for air sealing, crawl space and others. There are mainly two different types of spray foam insulation namely open cell and closed cell. Closed cell spray foam provides a higher R value per inch and it can easily be applied on ceilings, roofs and slabs. It is thought to be more expensive than residential and commercial insulation and it works better than any other type of insulation. It has a decent density and it adds a lot of structural strength to a ceiling or roof. Open cell insulation on the other hand uses water or carbon dioxide as a blowing agent. It can be applied on roofs, walls and ceilings. Whether you want to insulate an existing home or you are a builder who wants to get his house insulated, we can definitely help. We install both open and closed cell spray insulation. Moreover, we also provide attic, wall and crawl space insulation. All of them are different in their own might and types. As a company, we know the importance of insulation but at the same time, we also know the importance of the cost of insulation so we are willing to provide you with the best services at the right prices. We have a team that has access to the best products, prices and training in the industry and we do everything in our might to provide a variety of product and services to our customers. Our main goal is to make your life easier and we therefore, come up with all the necessary solutions to help you through times of needs. With our experienced and dedicated team, you will know that you have come to the right place for expert insulation and energy servings. We have the right team of builders, contractors and homeowners and we are willing to provide you with any service that you like and want. Aside from insulation installation, we also work to provide energy saving solutions. We are a group of certified individuals who can even perform important energy audits such as seal air leaks. We offer environmental friendly products and also ones that are energy friendly so we work to ensure that your energy consumption is reduced. There are many reasons why you can choose us. There are a lot of ways you can reduce expenses on consuming energy. One of these is through insulating your home. Foam insulation is known to be a good way for you to reduce the non-renewable energy. We work k to ensure we trap the heat during the cold winter months and come up with a solution that keeps you warm and settled. All and all, we are a perfect company to consider and hire. We are a group of reliable and professional individuals who are fully skilled and trained in providing the clients with the first class and best quality foam insulation services. If you are interested in your insulation plans of your home, we can help you save a lot of money and provide you with some of the best results. If you are looking for an elite provider, you can get a good and decent and ideal solution for your problem. Our services range from providing insulation services to local buildings and commercial buildings alike. One of our main areas of expertise is residential insulation. We work to provide insulation for homes at the right time and at the right prices. Every homeowner wants to get their house insulated because they want a decent solution that helps them save time and energy. We work to provide insulation for homes and we are just a call away. If you want any area of your house to be insulated, we can work to provide you with a good and decent remedy instantly. We as a company also work to provide commercial insulation. Commercial insulation is a part of many buildings etc. and we as company want to provide your company with the best insulation services. Commercial buildings are large and have to be carefully looked after. We as a company will work to ensure that we provide commercial insulation to keep your buildings safe and intact. As mentioned earlier, there are primarily two types of insulation services and we work to provide both. Open cell and closed cell. Both of these vary with respect to their properties but we provide both. Generally, if you are looking for a company that helps your during times of need and takes care of your insulation needs, we are your best bet. Not only do we provide insulation services for home purposes, we also provide them for commercial purposes. We take care of homes and commercial buildings. We work to ensure we do everything in our might to provide you with reliable spray foam insulation services in Long Island and ones that last a good amount of time. Moreover, we guarantee satisfaction and we will be there for you with top of the line customer support and affordable rates.